Vaisnavism played a very significant role in socio-religious and artistic expressions of Kashmir in ancient and medieval periods. Vaisnavism carved its due place in the mind of the people in the valley with equal amount, if not more than that of Buddhism and Saivism. In general, the religion of Visnu in the Kashmir valley shared the Pan-Indian notion, yet in certain aspects, it maintained its individualistic approach. Such differences are noted in the texts as well as in the artistic expressions of the valley. 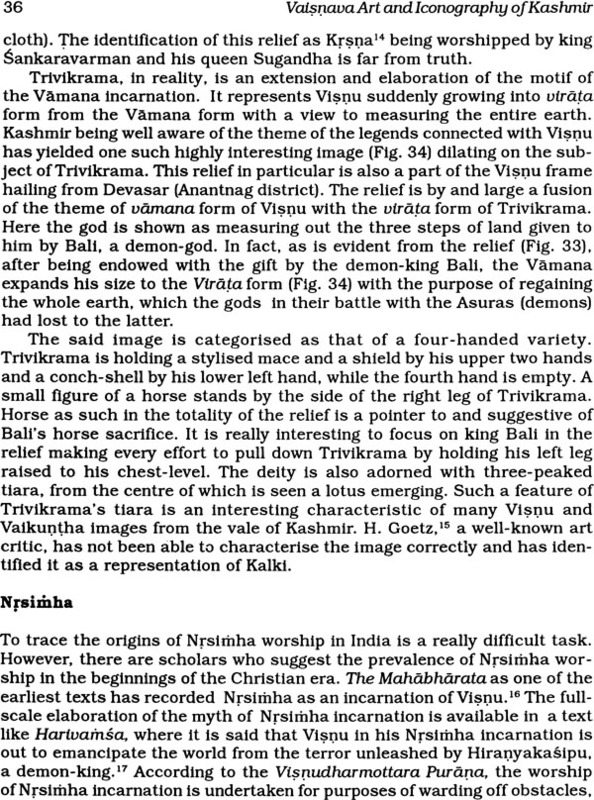 The present book deals with the various facets of Vaisnavism in Kashmir with particular reference to the Vaisnava icons nad art. 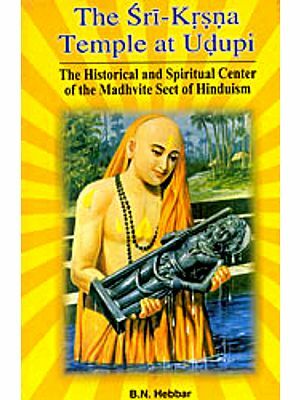 The book deals with Para, Vyuha and Vibhava aspects of Visnu a well as with composite and syncretic aspects of th god. Attention has also been paid to the minor Vaisnavite deities including the personification of Visnu's attributes. There has been a dearth of a comprehensive study of Vaisnava art and iconography of Kashmir and this book is likely to fill that gap. Dr. Bansi Lal Malla did his M. A. in History from the Kashmir University (1981). He subsequently obtained the degree of M. A. in Museology with Gold Medal (1983) and Ph. D. in History of Art (1987) from Banaras Hindu University, Varanasi. 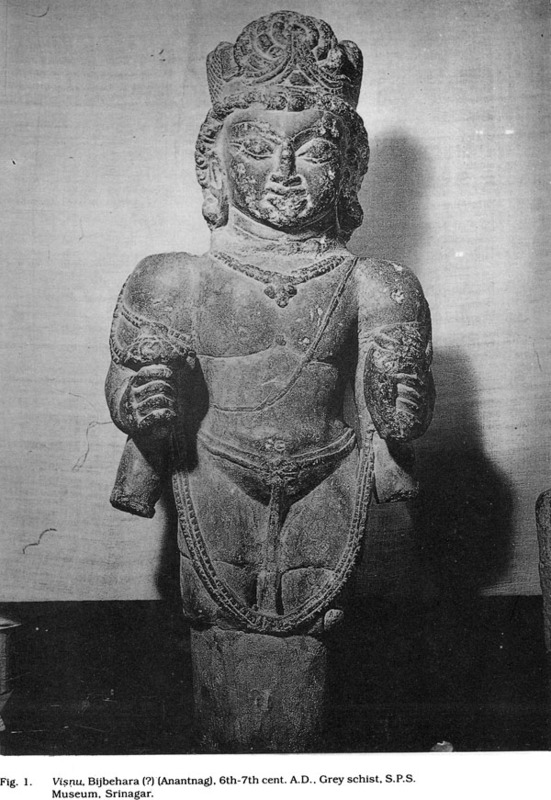 His first book entitled The Sculptures of Kashmir (600-1200 A. D.) was published in 1990. As a Post-Doctoral Fellow of ICHR, Dr. Malla worked on a project entitled t'The Tree Worship in Ancient India (A Socio-Religious and Artistic Evaluation)' and submitted the same recently. At present he is associated with the Academic Staff of Indira Gandhi National Centre for the Arts, New Delhi. He has to his credit a number of research papers published in reputed journals and has also participated in many national and international conferences/workshops. There is no gainsaying the fact that Kashmir has been a seat of learning and erudition from its hoary past. Its beauty and verdure, snow-capped peaks, sheen of sparkling waters, rustling leaves of dense forests, lakes and springs have charmed poets and creative minds to sing its praises calling it a paradise on earth. Inspired and motivated by the pristine beauty of landscape, the myriad minded genius of Kashmir has made immense contributions to all segments of human knowledge and creative ventures. Poetics, poetry, painting, sculpture, architecture, religion and music are some such domains as are vitally enriched by the Kashmirian share of contributions. Kashmir has recognisably carved a niche for itself in the total fabric of culture available in the Indian sub-continent and any attempt aimed at diminution of its role-profile as such does not deserve notice. The Kashmirian life-style al through the ages right from its seminal stages to the present state of civilization has been that of tolerance, mutual goodwill and humanism resulting in forging and strengthening of social bonds primarily responsible for shaping of a cultural ethos, which, in turn, affects the life of people living in close touch with it. Despite formidable mountain ramparts, Kashmir received influences of all sorts from the Indian subcontinent, but the innate Kashmirian genius absorbed them to suit its own cultural and aesthetic needs and aspirations. Be it put that the spirit of synthesis and assimilation has been the keynote of the Kashmirian culture. Buddhism, Saivism and Vaisnavism with their cult and credo got mixed up with the indigenous cult of Nagas making. The interaction and interpenetration between Buddhism and Saivism, Saivism and Vaisnavism, and again between Buddhism, Saivism and Vaisnavism and the indigenous cults and thought-currents generated new values of humanism thereby vitally enriching life and aesthetic standards allied with it. Present-day attempts to insulate Kashmir from humanism and synthetical modes of thinking cannot be overlooked as a mere aberration as these are aimed at destroying the essential genius of Kashmir. 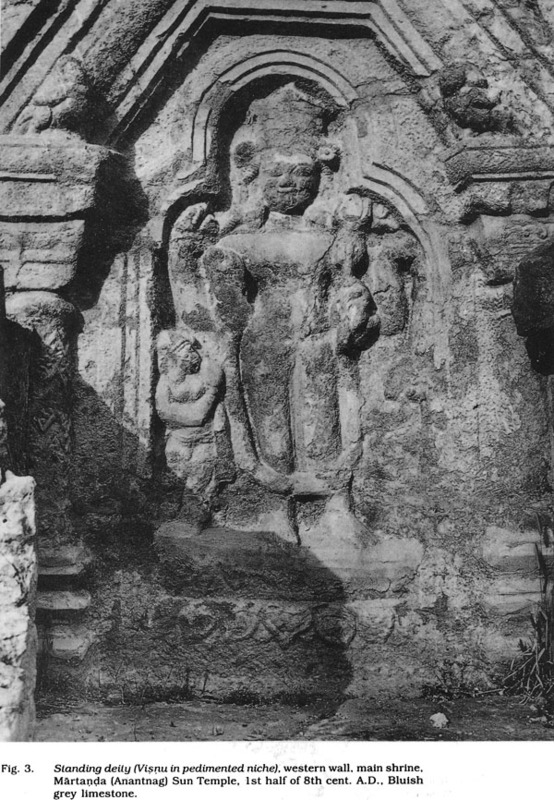 Early Kashmir in terms of religious systems was dominated by Buddhism and Saivism. While studying the Kashmirian culture, it is safe to put that besides the above-mentioned religious systems Vaisnavism was equally popular and well-circulated. Various religious and historical texts support the view that the Kashmirians hailed Vaisnavism the same way as they had hailed and embraced Buddhism and Saivism. 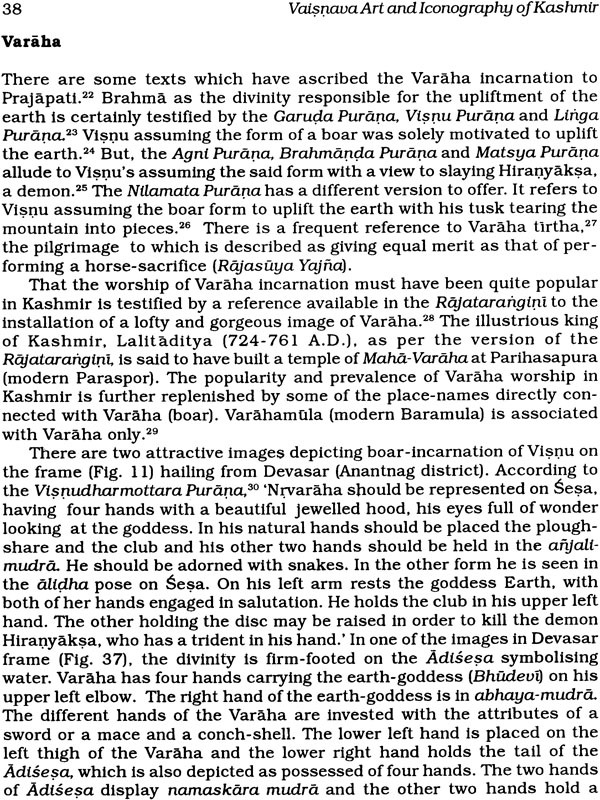 Names of lakes, mountain-peaks and places and evidence enough to establish the well-entrenched presence of Vaisnavism in Kashmir. The Pancaratra cult not only found its echo here, but got enriched by the fertile mind of Kashmir. 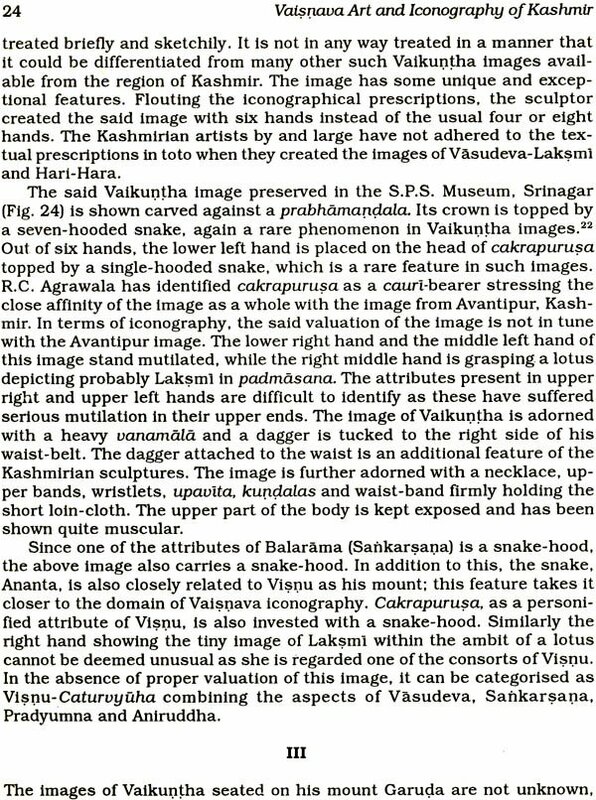 The said cult led the creative minds to mould and sculpt images known as Vaikuntha with their inherent characteristic features. The sweep of the Vaisnava religion in the valley preserved and enriched many such traditions as were getting extinct elsewhere in the country. 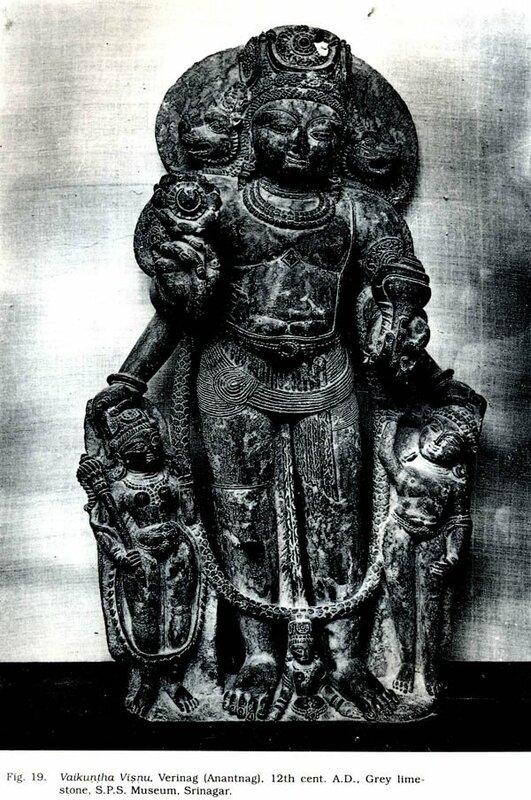 The Kashmirian contribution to the domain of Vaisnava sculpture has been both peculiar and enormous. Some stray efforts have been made in the past to highlight the Vaisnava iconography of Kashmir, but what has been lacking is a cohesive and comprehensive work on the subject detailing out the origin and growth of this segment of artistic expression. 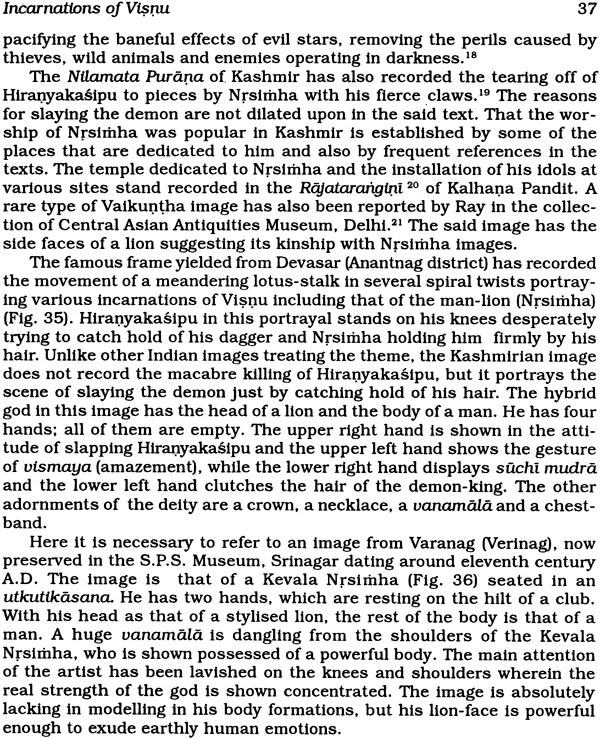 The rich heritage of the Kashmirian iconography has inspired me to delve deep into it and present comprehensive details of the Vaisnava iconography of Kashmir. 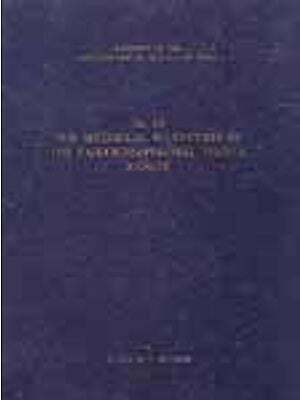 The present work studies Vaisnavism and its impact on iconography in a historical perspective. The primary sources of images and icons portraying Vaisnava themes have been utilized. 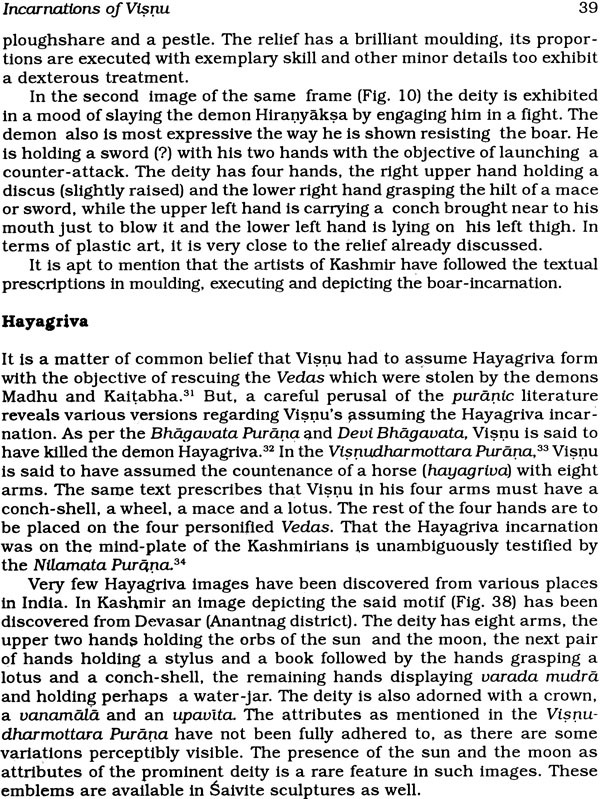 The epigraphical and literary materials have been profusely exploited to reconstruct the history of the Vaisnava religion with a view to reinterpreting the Kashmirian iconography. Various conceptions available with us are actually shrouded in mystery. An attempt to unravel the mystery around them has been made with a view to allowing a fuller understanding of the developments in the field and their impact on the Kashmirian iconography. I in all humility accept the good done unto me by many of my friends and teachers and guides. I have no hesitation to admit that the present work would not have been possible without their suggestions and valued guidance. I am highly indebted to my preceptor, Dr. T. K. Biswas, Joint Director, Bharat Kala Bhavan, B. H. U., Varanasi. He has been a great source of inspiration to me and it is his precious guidance that has led me to undertake the present work. 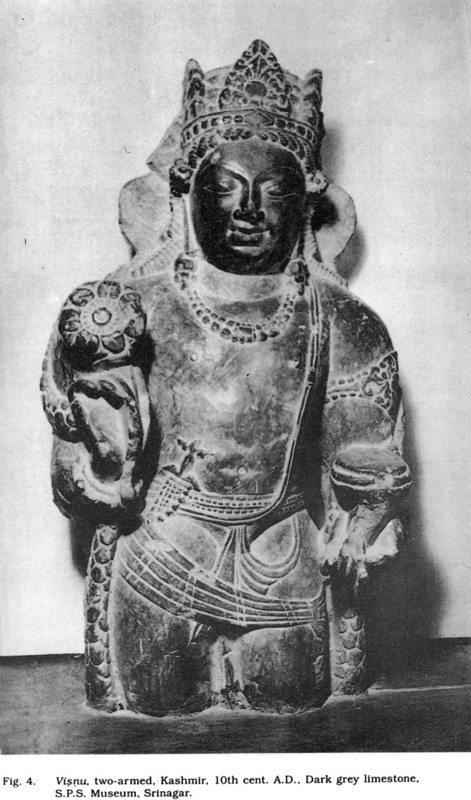 Shri I. B. Singh, Librarian, Bharat Kala Bhavan, B. H. U.
Dr. Ashok Oul, Lecturer, Deptt. of Sociology, B. H. U.
Shri S. B. Singh, Bharat Kala Bhavan, B. H. U., Varanasi. The American Institute of Indian Studies, Varanasi. Department of Archaeological Survey of India, Circle Srinagar. Lastly, I am deeply indebted to my revered parents Shri T. N. Malla and Smt. 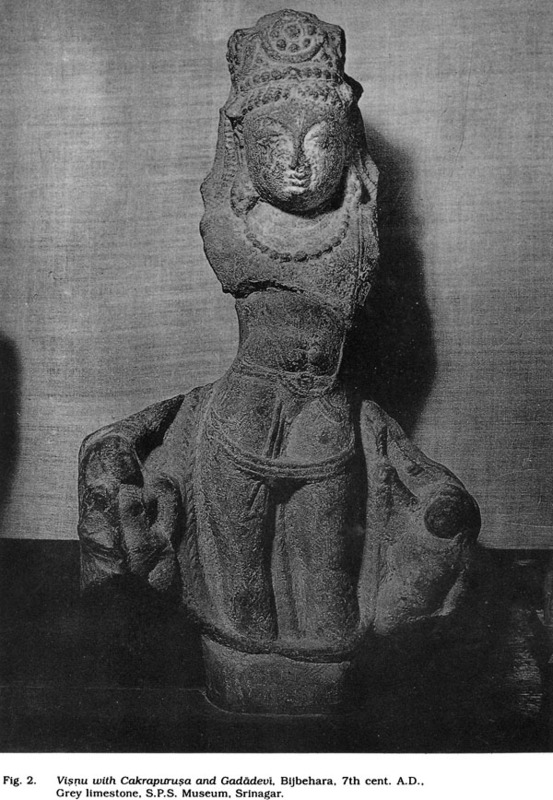 Sheela Devi. Without their blessings, this work would not have been possible.